Visitor Centre for the Arthur B. McDonald Canadian Astroparticle Physics Research Institute unveiled in Stirling Hall. The research being conducted by the newly-launched Arthur B. McDonald Canadian Astroparticle Physics Research Institute is providing answers to some of the biggest questions about how the universe works. And while many people may be interested in the ground-breaking work, it isn’t always the easiest to grasp. That’s where the institute’s Visitor Centre can help. 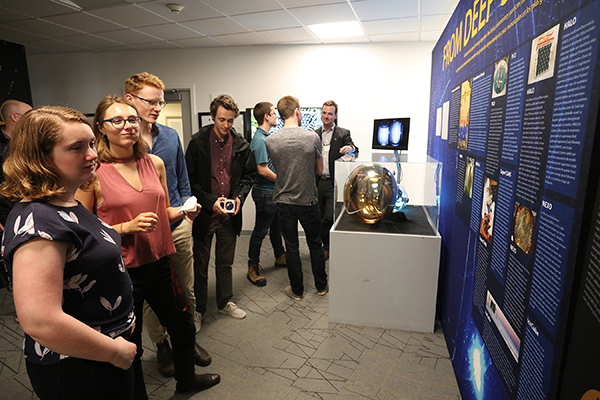 Launched on Thursday in concert with the McDonald Institute, named in honour of Queen’s University’s first Nobel Laureate, Professor Emeritus Art McDonald, the Visitor Centre is located in Stirling Hall, the campus home of the Department of Physics, Engineering Physics and Astronomy. The Visitor Centre, along with a new website, presents the ongoing research conducted by SNOLAB and the McDonald Institute, such as the discovery that neutrinos have mass and the search for dark matter, with the goal of engaging and connecting visitors to the questions and findings that are fundamental to the very properties of science and our understanding of the formation and evolution of the universe. In addition to a series of panels highlighting research, facilities, and developments, the Visitor Centre features a virtual reality setup that will allow visitors to travel though space and experience a solar storm. The centre also offers an augmented reality sandbox that will teach guests about gravitational fields in an interactive and tactile manner. On Thursday attendees of the opening ceremony, including a group of high school students, were the first to tour the Visitor Centre. It was also the first opportunity for the centre to see how visitors interact with the displays. The Visitor Centre is open Monday to Friday, 9:30 am-4:30 pm. Admission is free.